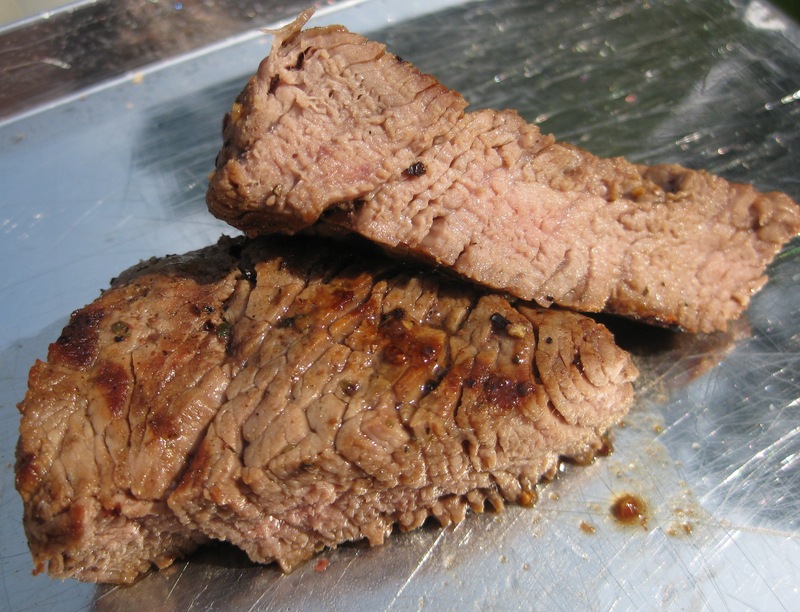 There are many transformations that occur in meat, well all protein, during cooking. 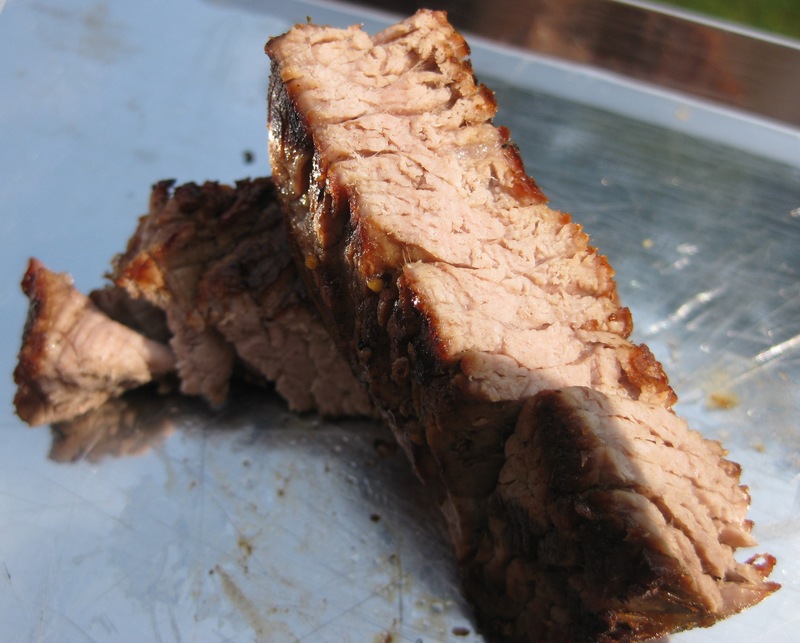 Here’s a primer on How to Cook Meat to help you understand the process and become a more competent and confident cook. of doneness you want and the range is broad: rare with a black and blue center, medium-rare with a rosy warm center to well done or the proverbial hockey puck that’s dry and gray. I did a little experiment to show the time, temperature and outcome for rare, medium rare, medium, medium well, and well done with five small ends of filet mignon, each seasoned with salt and pepper and dab of olive oil. 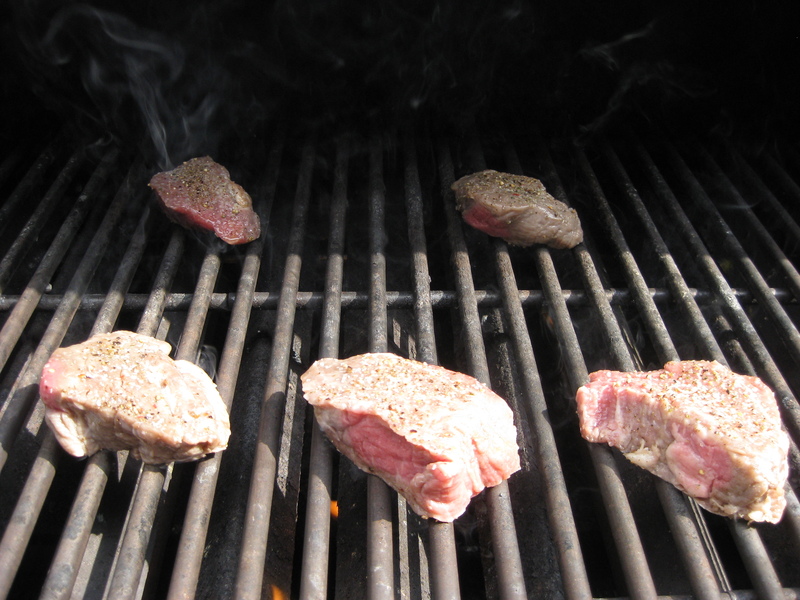 I grilled them using a large Weber grill (Summit model) with 6 burners. 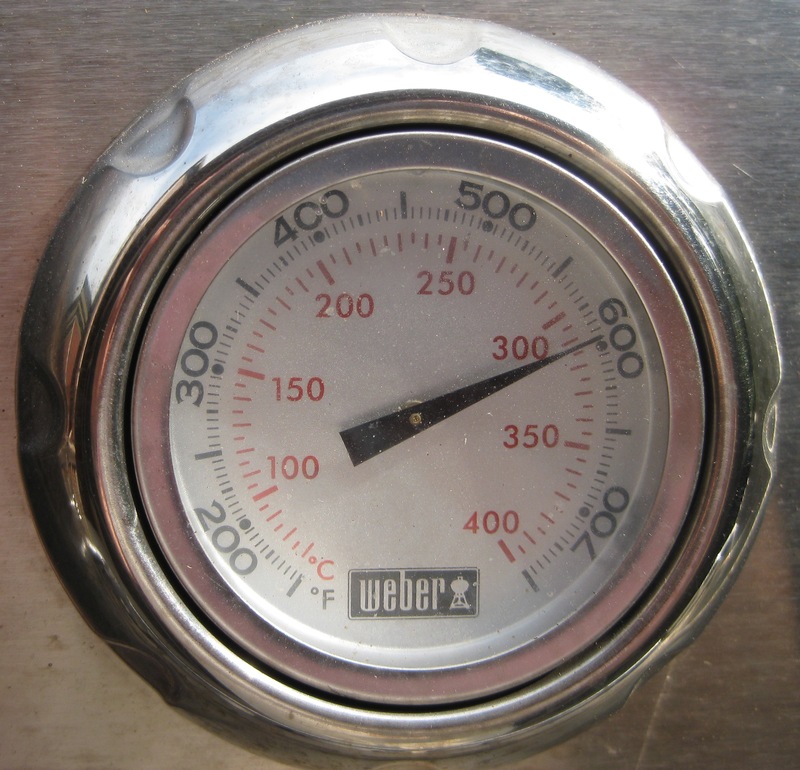 The temperature reaches 600º F in 15 minutes. 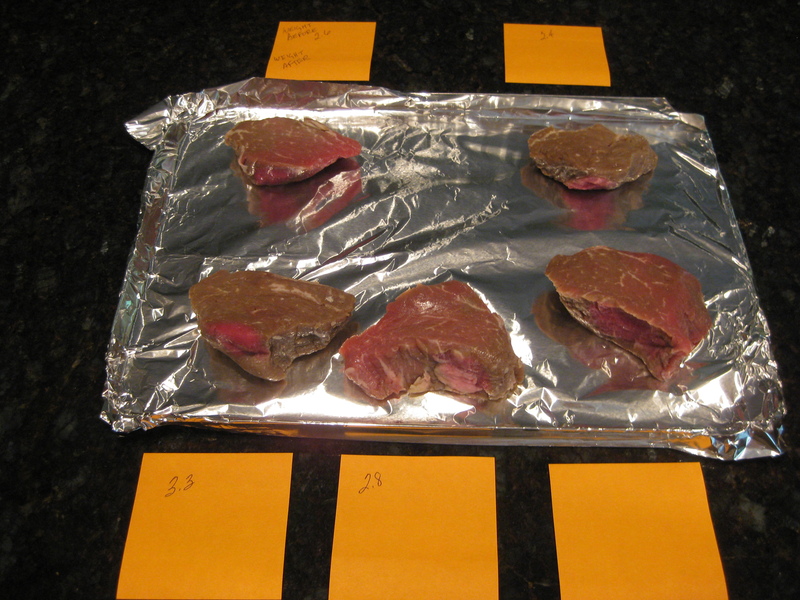 First, I weighed each raw filet and placed them on a lined tray with sticky notes strategically placed to record the data. 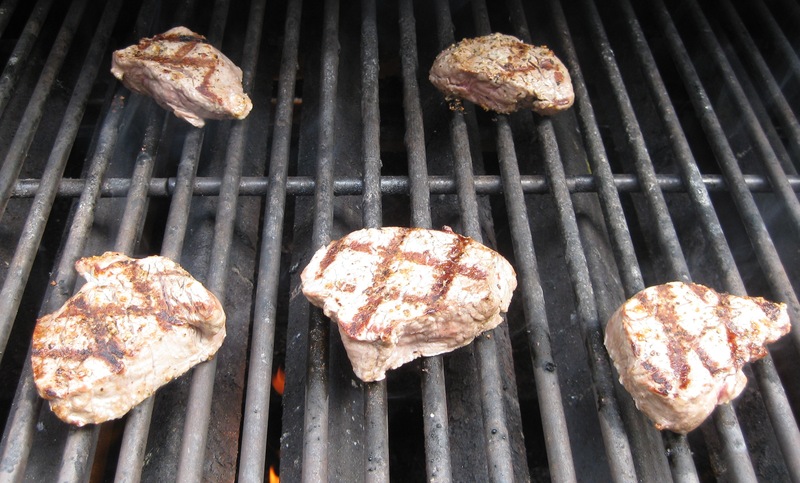 I put the filets on the grill at the same time and turned them 90º after 60 seconds, and cooked for another 60 seconds to create crosshatch marks. I flipped them and continued cooking another 60 seconds; turned each 90º and turned the heat to low (in colder months I would lower the heat to medium). The drop in temperature was gradual. Not a problem for the filets coming off quickly, but important for the more well done ones. The lower temperature prevents excessive loss of juices and allows more uniformity in texture. The rare filet came off first, after an extra 30 seconds. Notice the loose structure and red color. The medium-rare filet came off a minute after that. The structure is not as loose and the color is pinky red. 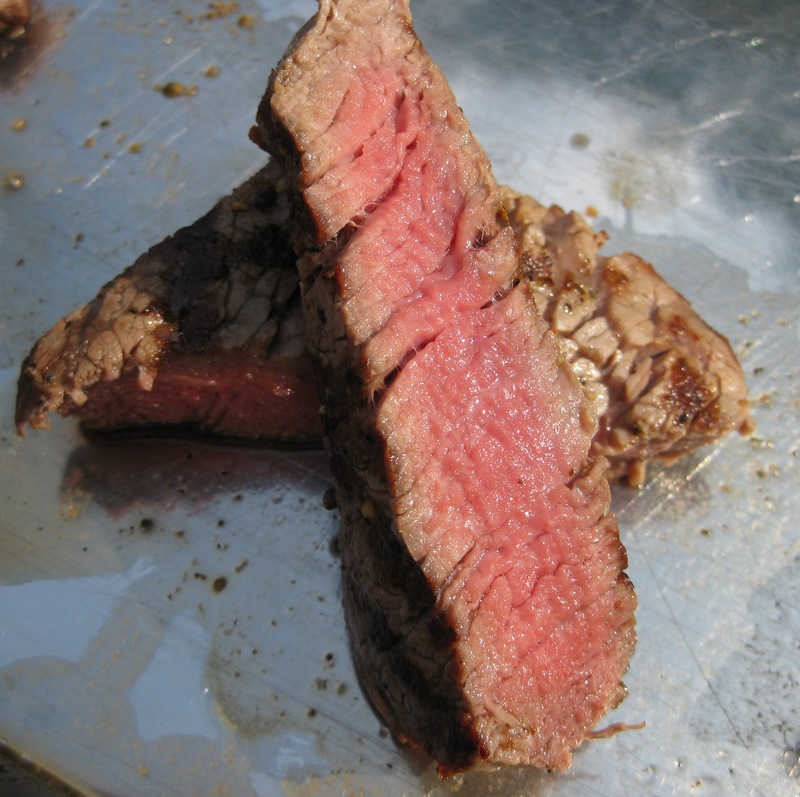 The medium filet cooked another minute and a half and has firmer structure, a light pink center, and retains some moisture. 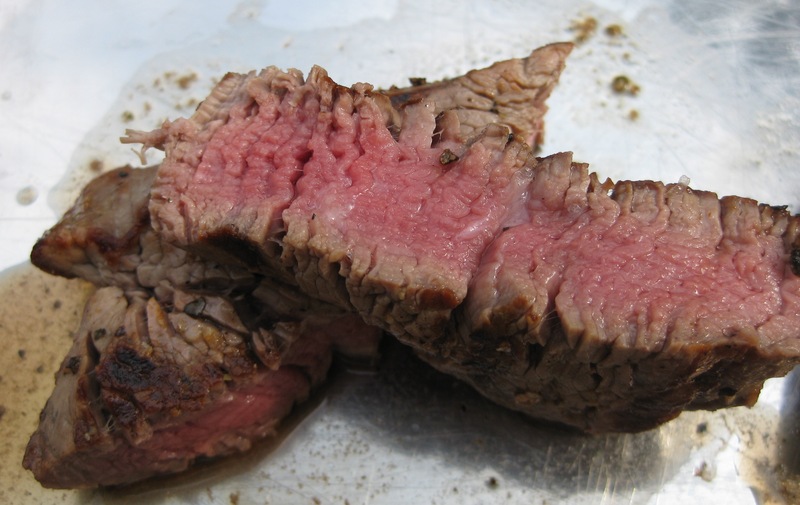 The medium-well filet remained on the grill for another three minutes. The structure is firm with a pink-gray center. The meat is still a little moist but getting chewy. 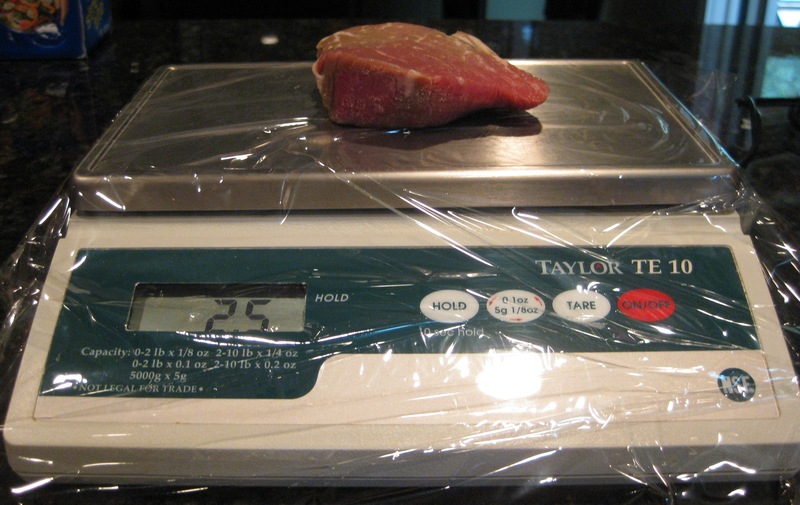 Notice that the moisture loss is the same as the medium filet (25%). The reason for that is the lower temperature, which gently cooks the meat and allows for more retention of meat juices than high heat. The well-done filet cooked for five and a half minutes more. Colorless center, very firm, and chewy. 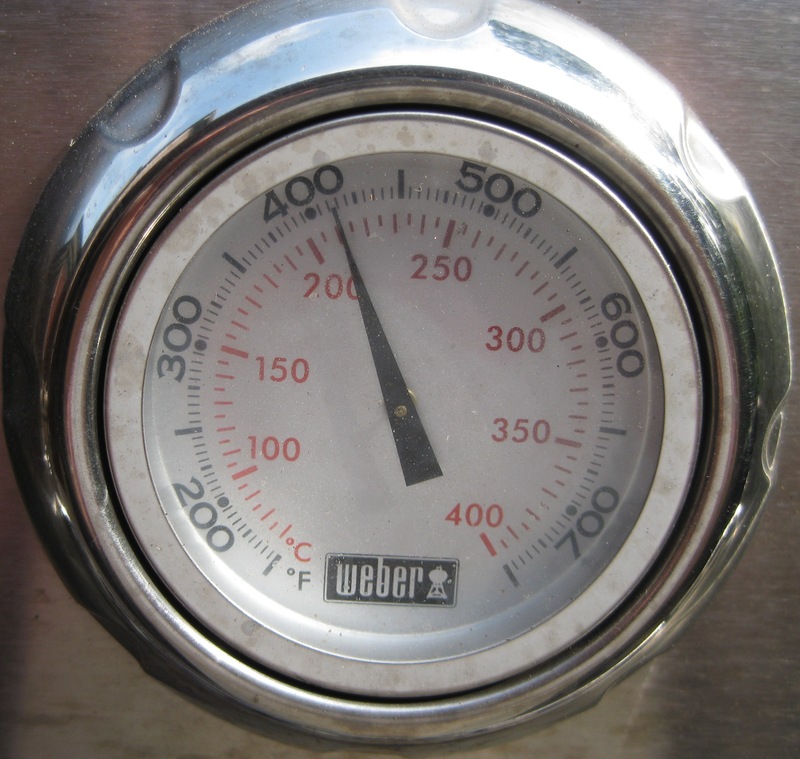 Had I left the temp at 600º F, it would have cooked faster but would definitely be much drier and solid — get out the saw, the steak knife just won’t cut it! 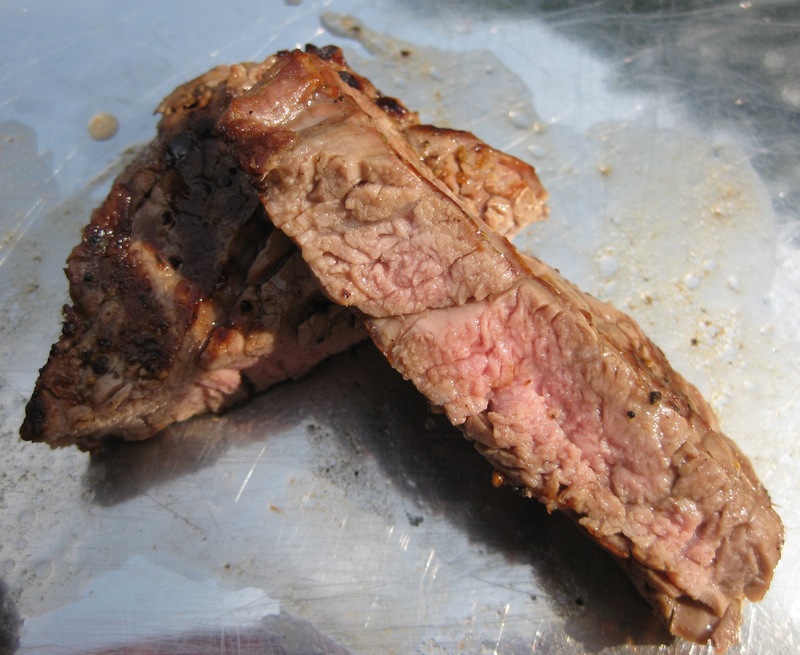 Contrary to popular belief, searing meat does not form a “leak-proof” crust. Juices are not held in, they escape throughout the cooking process. 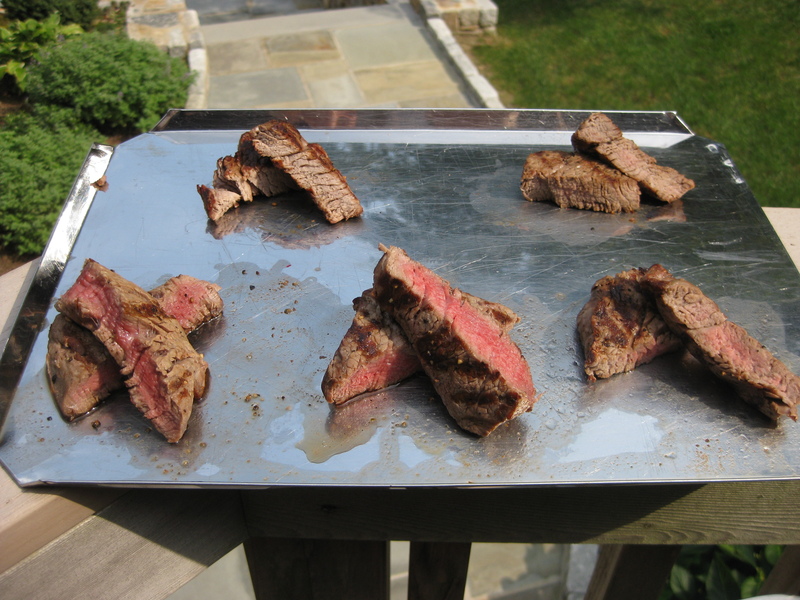 Just look at your platter when you remove meat from a heat source, juices pool in the bottom of the dish. A seared crust is esthetically and palette pleasing and definitely worth the time and effort needed to achieve it. Rest meat for a few minutes after cooking. The internal temperature of the meat is still high, especially with more well-done items, and meat continues to cook off heat. Waiting a few minutes before serving and/or cutting allows juices to become structurally bound within, resulting in more succulent meat. 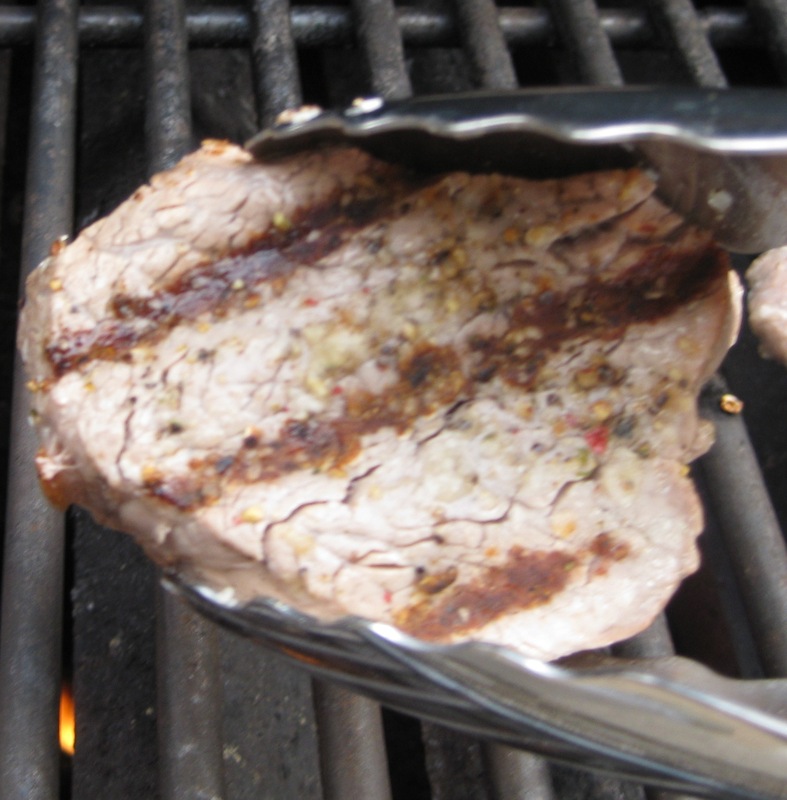 Keep these principles in mind and you’ll know how to cook meat perfectly every time. See also our post on how to cook proteins for a more scientific look at denaturation and coagulation.